Anti-government protests left more than 20 people dead, and hundreds more were arrested. The leader of Iran's Revolutionary Guard says a string of anti-government protests in the country have come to an end. Gen. Mohammad Ali Jafari announced the "end of the sedition" on Wednesday. Iranian state media showed pro-government rallies in a number of cities after six straight days of unrest. The protests started as a demonstration in Mashhad against economic woes and corruption, but quickly spread to other cities and turned violent. At least 22 people have died and hundreds have been arrested. 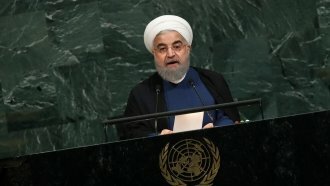 President Hassan Rouhani, elected in 2013 as a reformer, has called for unity and wants to address economic problems — specifically unemployment, which is high among youth. Supreme Leader Ayatollah Ali Khamenei, Iran's head of state and top religious cleric, blamed the Islamic Republic's "enemies" for the protests.